Does anyone know of any master boot record (mbr) sector utility that will clear or erase the DiskID field on an external USB hard drive? Several problems relating to Ghost 9/10 Copy Drive feature or Ghost 9/10 backup/restore feature depend upon booting from the Ghost emergency boot Recovery Environment CD. As discussed by Dan Goodell in other threads and at his website, booting problems and recognition problems often occur because the DiskID field on the new drive (or external drive) conflict with the new boot environment. I've read about ways to clear the DiskID field on internal hard drives, but never for an external USB drive. Any suggestions or ideas? Most sector utilities are DOS based and do not or will not touch a USB drive. I've never seen a Windows XP utility that will modify the boot record for an external USB drive. Re: Erase DiskID on external USB drive ? "Most sector utilities are DOS based and do not or will not touch a USB drive. I've never seen a Windows XP utility that will modify the boot record for an external USB drive." How about trying Roadkil's NT-based Sector Editor? I don't use external HDDs so don't have much experience with them, and the few I have tried were natively recognized by the bios when booted to DOS (Dell Dimension 4700's, 9100, 9150). Thanks again Dan! I successfully reset the DiskID of my external USB disk drive!!! Before the change, my external drive letter was k: and after the change, I rebooted XP, and when it restarted the drive letter was f: (which is the next available unused drive letter in my PC). Here is the procedure I used with Sectedit from roadkil. All operations are used from Windows XP. After starting Sectedit, I got a menu asking for "Select Disk". Choices were Logical C, Logical D, Logical E, and Physical 2.
so you don't accidently change the wrong USB drive. Retest your Ghost 10 emergency Recovery Environment boot CD. Ghost 10 should see the USB drive now as an "new unassigned drive" and will give it a compatible drive letter that Ghost 10 chooses. Note new drive letter assigned by XP. I think this will be an invaluable tool to fix Ghost 10 Recovery Environment boot CD issues that are caused by conflicting drive letter assignments stored on the external USB hard drive DiskID. John, I'm still not clear on how this differs from changing the drive letter from K: to F: in Disk Management. Once changed to F: it will keep that letter. After clearing the DiskID, you don't use Disk Management to change it back. You shut down, then boot from the Ghost 10 RE CD. Ghost 10 RE will see it as an "unassigned" drive. The RE will then be free to assign an appropriate drive letter and signature that works for the RE. This is only a temporary workaround until Symantec fixes their boot cd pre-environment logic. I'm with you now. I misunderstood your previous post and wondered why you wanted to change from K: to F: in Windows. Clearing the DiskID is essentially Method #3 ("Kawecki's Trick") as outlined by Dan Goodell, but instead of using Method #3 with fdisk /mbr for an internal IDE drive, you use Sectedit to do the same thing for an external USB drive . John, in your Reply #3, could you explain what hex 01B8 means? How does that correlate with BE E7 FC AF? In the screenshot above, the physical address of each byte in the sector is shown in the list on the left. the contents of those sector addresses are then displayed across the screenshot. It starts with the first sector addresses of 0000 (and reading left to right on the first line) through 000f. The second line continues 0010 through 001f. Those four bytes are the DiskID, which must be zero'd to reset the drive signature and drive letter. Thanks for your ongoing research into this problem with Ghost 10's Recovery CD and USB HDD's. I suggested Symantec's *DiskEdit* program in reply #2 above as one option, but because not everyone will have access to that, I also looked around for something that's available to download from the Net. I used my DOS boot disk with the Panasonic USB DOS drivers on it to boot to the A:\ prompt. I had saved the *PTS Disk Editor* program file (de.exe) to my G:\ partition, so did a drive change from A:\ to G:\ by typing *g:* at the A:\ prompt. I have two internal HDD's (drives 1 and 2), and I have two USB 2.0 external HDD's hooked up to a powered USB 2.0 Hub (drives 3 and 4). I went to Sector 62, which is where Ghost 2003 *marks* a HDD the first time it sees that HDD (in DOS, you can refuse to let Ghost 2003 *mark* the HDD, but if using the Windows interface--you must let Ghost 2003 *mark* the HDD, or else it will not allow you to proceed with the Ghost procedure you're setting up). Everything worked without any problems. This is my other USB HDD--I have never allowed Ghost 2003 to *mark* this HDD, so you see that Sector 62 is *empty*--all *zeroes*. You might be wondering why I have gone on about the *Sector 62* in my last post--I have an ulterior motive ! You have used editing the USB's disk ID to force Ghost 10 to re-assign drive letters when you boot the Ghost 10 Recovery Disk. Editing the disk ID also means you will have to re-assign the disk drive letter in WinXP as well, if you want it to be a particular drive letter. I think Symantec must be writing to the external HDD, code that *remembers* the drive letter assignment of the USB HDD that is seen while in WinXP--and is trying to have that same drive letter show up in the *Recovery Environment* when you boot the *Recovery Disk*. 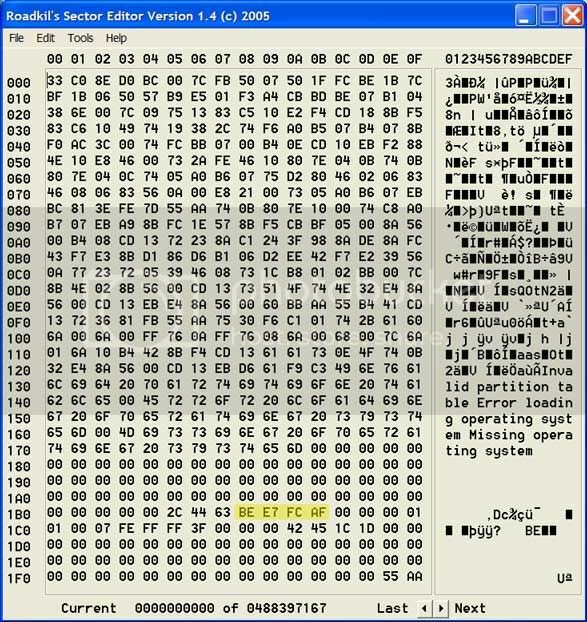 Can you check Sector 62 on your USB HDD, using the *Sectedit* program from Roadkil, to see if Symantec's Ghost 10 is recording any code to that Sector 62 that might be allowing it to remember the WinXP drive letter assignment of the USB HDD? If it is, it may be possible to edit that Sector 62, zeroing it out, rather than editing the disk ID in order to force Ghost 10's Recovery Disk to assign useable drive letters to the USB HDD. Thanks for the clarification and information. I stand corrected about DOS utilities not being able to write directly to physical sectors on USB drives. I don't think Ghost 10 is re-assigning drive letters when booting from the RE cd. It's the Windows Pre-Environment. Unfortunately what I discovered several months ago was that if the Pre-Environment found z: as the assigned drive letter, then it basically did not mount the drive. Hence Ghost 10 never got a chance to see, much less restore my image. The next time you start up the XP Windows Pre-Environment cd, it will find a DiskID present, and try to honor that assignment. After clearing the DiskID field, XP filled it in again but used the next-available drive letter, which was f: in my case. You're right though that I would have to manually reassign it if I had programs or other data on it that pointed incorrectly. However, just seeing it was a big improvement because that meant/means that I can use Ghost 10 RE cd. So I redefined the Ghost backup definitions to the revised drive letter. I looked at sector 62 and it is all zeros. Of course I have never used Ghost 2003 which I think explains why it was never marked. I don't claim that all of these tests and observations are 100% correct, just how I understand them as of now. Any help NightOwl or guidance from anyone appreciated. I'm just trying to get Ghost 10 Recovery CD to work (reliably) ! So, is sector 62 the Ghost 2003 equivalent of DiskID for Windows XP/Ghost 10? I remember that Windows 98 had problems remembering drive letters for devices. I had just assumed that XP corrected that somehow. Later I found out about 01B8 (DiskID) field.